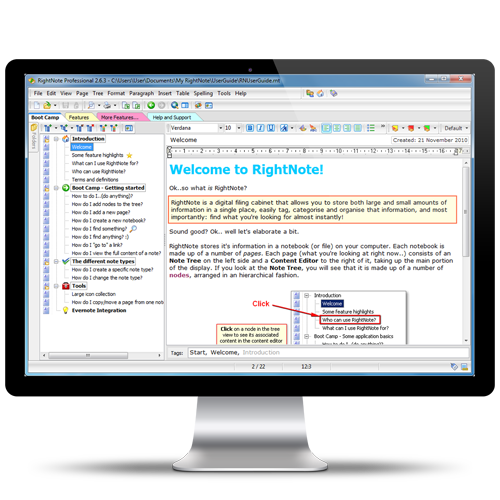 Each note in RightNote can be one of several different note types - including word processing, spreadsheet and source code note types. This allows you to seamlessly include different types of information in a single notebook. The in-built full text search engine allows you to find what you're looking for ultra-fast. No complicated search dialogs - just type and see highlighted search results as you type! RightNote includes a flexible protection scheme that allows you to securely protect information in any note, tree or notebook with industry standard 128-bit encryption. RightNote's advanced HTML paste feature allows you to import web-page content with images and style information intact so that imported content looks very similar to the original. Numerous keyboard shortcuts, hotkeyed predefined styles, predefined text and background colors, and recent and frequently used note lists help you perform common and repetitive tasks more easily and efficiently. Powerful import and export options allow you to import data from various sources as well as export to common file formats such as .txt, .rtf, .rvf, .html and .xls formats. RightNote includes many application options that allow you to configure the interface to your own personal liking and preference. Keep your important information with you "on the go". Run the application from a USB stick on any computer without interfering with any host computer settings. 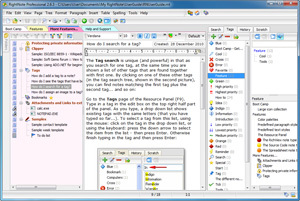 The freeware version includes a large subset of features of the commercial version and is free for both personal and commercial use. Having a single place to store your notes. When you are confronted with new information you immediately know where to put it. Know where to find your information. If you put your information in a single place then you’ll know where to find it! Efficient workspace and workflow. Keep RightNote minimised to the system tray: when needed activate with a global hotkey shortcut, when no longer needed minimise with the escape key. Easily navigate and manage large trees with the new Folder Tree feature. Any child notes of a folder note automatically get tagged with the note’s caption. This allows you to organize and tag at the same time. The Evernote Sync allows you to access selected notes from any mobile device, desktop or browser (via the Evernote service). After purchasing the product you will be sent an email with a registration code (serial number) that unlocks the trial version, and allows you to continue using the program. Registered users receive free updates for a period of 12 months. Payment is made via MyCommerce who provides safe and secure handling of the transaction. Since installing it, I find RightNote rapidly becoming my goto database. It’s light on resources, clean, and extremely feature rich while remaining simple and easy to use and learn. I have tried more organizing programs over the past 20 years than I could begin to count (not kidding) and have rarely used them longer than a month. RightNote is helping me work, organize important data, and finally write that book I have been putting off for years. The combination of Spreadsheet and Notebook, combined with Tabs, is something I was looking for all my life. Furthermore the program has all the features a busy person like me needs to get things done, very easy to use. At last I can organize my work as it should be organized. Just a quick note of support saying I love RightNote. 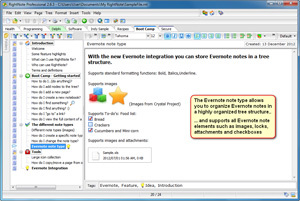 I’ve been looking for a quick notes manager with the ability to password protect specific notes, to have on my USB key, but so far I’ve not been satisfied with what I’ve found. That is, until I tried RightNote.